The Paprika Festival is the only festival of its kind in Canada and I can say first hand, it makes one truly excited for the future of theatre in Toronto. Perhaps one day this festival will be Canada-wide, but for now, it is a wonderful celebration of the work of young theatrical artists in our fair city. Charlotte Corbeil-Coleman is a notable alumna. I saw three plays in the Festival this week or, rather, workshops of each. I have to say I was stunned by the amount of talent from these young artists. If you are feeling old and unaccomplished, this is definitely not the festival for you! The first workshop was a musical called Life After, which is the creation of Britta Johnson through the mentorship of Reza Jacobs. I am assuming all of the young actors were also under the age of 21, but there didn’t seem to be information on that so I can’t confirm. Most were definitely in the younger range. I was awestruck by Life After and can barely believe that what I watched was merely a work in progress. The music was beautiful and complex and completely current. This past year I reviewed the stunning Broadway show Next to Normal and this is the closest comparison that I can make. The show begins with a group number at a funeral, outlining the absurd nature of a buffet at the moment of tragic loss. Kaitlin Torrance read/sang the lead role of Alice and she was phenomenal. It’s been a long time since I was under 21 and listening to musicals and it is clear to me how far they’ve come. There was earnestness in the writing; such interesting phrasing in the music and it seemed to be such an authentic portrayal of a teenager dealing with the loss of her father that I was captivated from beginning to end. It is one thing to write in an authentic voice. It is quite another to put music to that. Keep your eyes out for Britta Johnson and for this amazing piece whenever it comes to its full fruition. Hell, go see another reading! It’s that good. 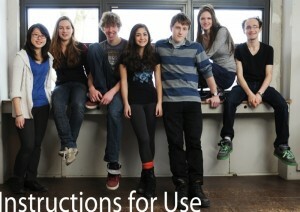 The next piece was a staging of a short play called Instructions for Use. This was a playful piece that felt a little closer to the age of the writer, even though it is primarily about adults. We were brought back to the world of the young adult when a boy in a roomy suit declares that he is the biggest land developer in all of New York. Teen actors aside, Aviva Phillip-Muller’s piece as mentored by Weyni Mengesha had sweetness and charm and there was a bit of a Woody Allen type of feel here. A humble schlep named Emanuel writes manuals for a living (get it?) and has a secret crush on the woman across the hall. I liked that it was set in an apartment or condo building; it had a nice city type of intimacy and I thought David Madras’s Emmanuel was perfect. I found the piece to be fun and sweet with the feeling of a great but quirky romantic comedy. The final presentation I saw was another staged reading, this time set in the upstairs rehearsal space of the Tarragon which Paprika has magnificently transformed into a cabaret. It was called A Gorgeous Decline of a Mind and it was crafted by Sabrina White, announced as the youngest member ever in Paprika’s eleven-year history. The 15-year-old White, under the tutelage of Haylee McGee, has crafted a postmodern and often hilarious look on Schizophrenia. With non sequitur rants and at times, sing-song dialogue between the different personalities of Charlie (played wonderfully by Lucas Costello), the referencing and pacing of this piece felt more like watching a new work from Daniel MacIvor than the creation of a high school girl. I think I most enjoyed the comedy and slight absurdity of the piece. White is at once intelligent and insightful without ever being precocious. Charlie’s rant on High School Musical had the audience laughing whole-heartedly and felt completely authentic when juxtaposed against the bitter sweetness of the entire play. She is truly a gifted writer and the reading was well done. With young talent like Sabrina’s, the future of Canadian Theatre looks very promising. Bravo to all who make The Paprika Festival happen. They work hard to foster the future of our Canadian Stage.